Whether you’re trying to lose weight or simply maintain what you’ve got, there’s nothing that will sabotage your efforts faster than a craving for, well, anything you can get your hands on. But sometimes in an attempt to eat healthier, you make yourself hungrier, by depriving your body of the nutrients that keep you full and help you avoid that mid-afternoon trip to the vending machine. On the other hand, fiber-rich complex carbs get digested slower and help us feel fuller longer. These include fruits, vegetables, and whole grains like brown rice, whole-wheat pasta, and oats — all of which reduce spikes in insulin and prevent the “crash” some people feel after eating sweets and simple sugars. Adults should eat at least 25 grams of fiber per day, which is best achieved with about 9 grams at each meal, Colleen explained. Protein is also a key component for staving off hunger. 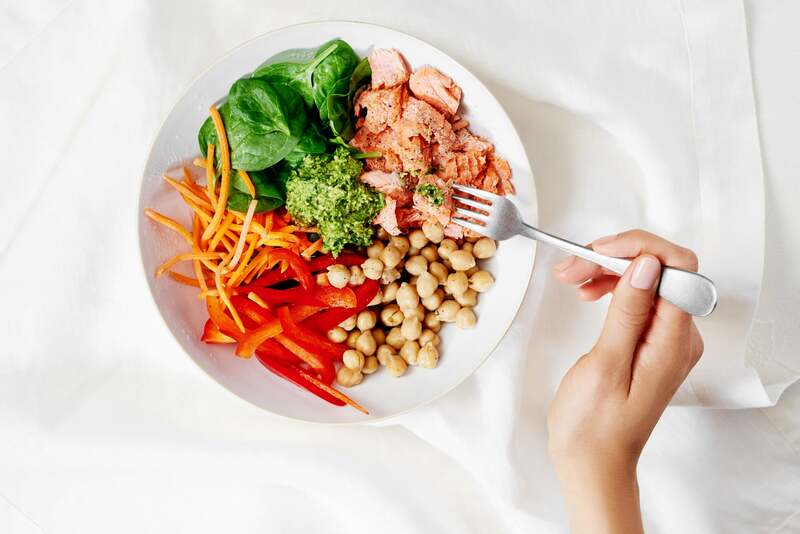 “Because protein takes longer than carbs to digest and doesn’t send our blood sugars on a roller coaster ride, we tend to feel more stable and satiated after eating it,” Colleen said. Protein can come in the form of any animal products from poultry, meat, and fish, to eggs, yogurt, and cheese. Plant-based proteins include beans, corn, soy, and tempeh, as well as whole grains like quinoa. Finally, you also need fat for a completely balanced meal, though you should reach for healthy options, like avocados, nuts and nut butters, flaxseed, and oily fish like salmon, tuna, and sardines. “Healthy fats also allow us to feel satiated for a long period of time. At eight to 12 hours, fats take the longest of all macronutrients to digest, which explains why we feel full after eating guacamole,” Colleen said. So, if you find you don’t feel full with just a plate of baked chicken and vegetables at dinner, add a healthy fat, such as a side salad with avocado or olive oil dressing, to feel more satisfied without wrecking your diet.